Today in America TV Host Terry Bradshaw is scheduled to speak at April benefit events to motivate and inspire audiences. Always willing to do good work for worthy causes. 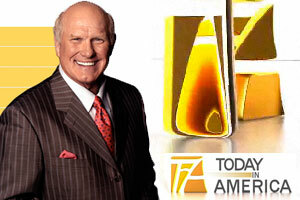 Today in America TV host Terry Bradshaw will speak at two different events in the month of April. The often requested sports celebrity will be a keynote speaker at the Roy L. White Legacy Gold and Gala at Union University in Jackson, Tennessee on April 26. The school is located 80 miles east of Memphis and has a strong Baptist background and offers many religious courses of study. The “Race for Grace” annual Derby-time fundraising dinner in support of the Kentucky Race Track Chaplaincy will be held on April 30 in Millionaire’s Row at the Churchill Downs. Bradshaw will be the guest speaker at the event which is a source of funding for the church that supports the workers of the world famous race tracks and horse farms in the Louisville, Kentucky area. Bradshaw, a former professional football player and Hall of Fame inductee, is known to be open about his Christian faith and how it pulled him through difficult times. Both events have a strong faith background and are looking forward to being inspired. In addition to motivational speaking engagements, Bradshaw can be seen on Fox Sports as an analyst, is a spokesperson for Nutrisystem, and is the host of Today in America with Terry Bradshaw. The award winning cable television show reviews a wide variety of topics and is distributed on regional and national television networks such as ESPN 2 and CNN Headline News. It is filmed around the world and edited in Coral Springs, Florida. Today in America Terry Bradshaw is active on all of the major social media platforms. To see sample video clips from the show, please visit YouTube. For more information and to locate air times, please visit todayinamericatv.com.